Get double the hydration with this collection of super sized Precious Moroccan Argan Oil products. 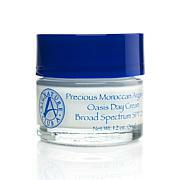 This super hydrating day cream gives your skin a long lasting daily dose of moisture. Formulated with Argan Oil and Baobab extract, the combination of these two desert tree extracts and other key ingredients help provide moisture to dry, skin. When skin is flaky and dry it can make you look aged beyond your years. The superior hydration abilities of the combined intense moisturizing ingredients in this formula give your skin a drink of youth. Your skin will feel smoother, hydrated and appear younger looking. The super moisturizing abilities of Baobab extract when paired with the super moisturizing ability of Argan Oil make an extremely powerful, superior combination for hydrating even the driest skin. Formulated with Argan Oil, rich in flavonoids, oleic acid, linoleic acid and fatty acids as well as botanicals found in the ancient tradition of 'ayurveda', this formulation will help to bring balance and moisture to the skin and optimize skin renewal during sleep. Ingredients: Active Ingredients: Octinoxate 7.5%, Oxybenzone 6%, Octisalate 5%, Avobenzone 3%. Inactive Ingredients: Acrylates/C10-30 Alkyl Acrylate Crosspolymer, Argania Spinosa Kernel Extract, Argania Spinosa Kernel Oil, Ascorbyl Palmitate, Butylene Glycol, Butylparaben, C12-15 Alkyl Benzoate, Calcium PCA, Carbomer, Cetyl Alcohol, Cyclohexasiloxane, Cyclopentasiloxane, Dimethicone, Disodium EDTA, Ethylhexyl Palmitate, Ethylparaben, Fragrance, Glycerin, Glyceryl Stearate, Hydrolyzed Adansonia Digitata Extract, Isobutylparaben, Isostearic Acid, Methylparaben, Mica, Octyldodecyl Neopentanoate, PEG-100 Stearate, Phenoxyethanol, Phospholipids, Propylparaben, Retinyl Palmitate, Serenoa Serulata Fruit Extract, Sesamum Indicum (Sesame) Seed Extract, Silica Dimethyl Silylate, Sodium Hyaluronate, Steareth-20, Titanium Dioxide, Tocopheryl Acetate, Tridecyl Salicylate, Triethanolamine, Water. I use many of Adrienne's products- Vitamin c and Retinol caps for instance- and this is a nice addition to the moisturizers that pair with those. The caps are great at night and the serum is hydrating and smoothing any time of day. This was a nice addition to my skin care rotation. I have been using these products for about a year. 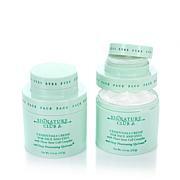 They really help your skin look more youthful. They are very moisturizing. I especially like the argan oil capsules. I use them at bedtime and wake up with very soft skin. I would recommend these products to anyone, men too, over 50. They probably work well for any age.Very good skin care line. I love the capsules, Use the other items but really buy for the capsules. I love this collection! I have used another high end Argan oil and this one is so much better and I truest believe it is the baobab that makes a difference. I can feel my skin drink it all the way in. So much hydration and no greasy feel at all. Very smooth. My makeup goes on well, my rosacea skin is very calm and no longer inflamed. I love the individual capsules. Just perfect on all fronts. 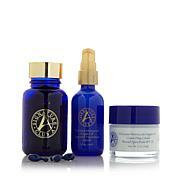 Love, ,Love,, Love, This Argan Oil collection. I use a lot of Signature club products but the Argan products are my favorite. The night caps make your face feel soo silky, and I cant stand to be without them. Using them all together is so hydrating! !